Revolver Galerie, Buenos Aires, Lima – one of the booths in the Focus section – presented an installation piece by Andrea Galvani. 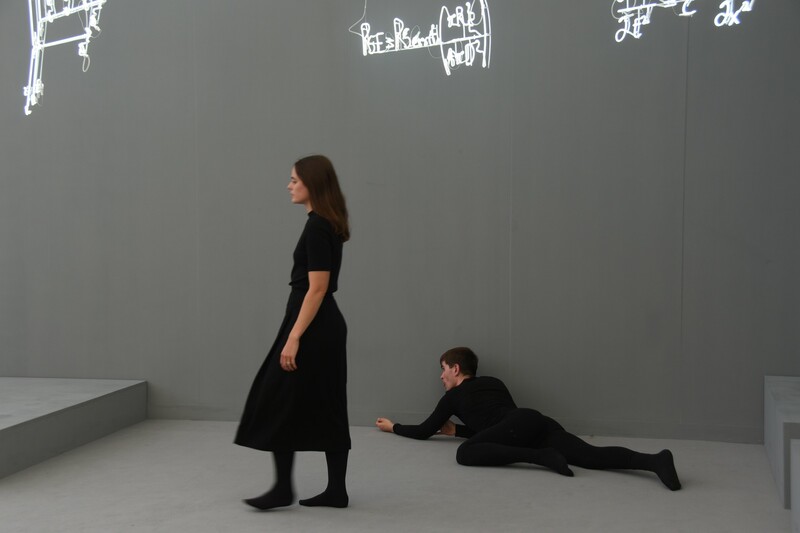 Slowly gyrating around a series of white neon mathematical equations, the performers hummed haunting acapella harmonies as they moved across the stand. It was as if the sounds of the universe, represented by the equations, were humanised by the actors. Revolver was listed as one of the top 10 booths to visit by Mutual Art, but Andrea Galvani’s performance seemed to run into trouble on my visit; an assistant was insisting Frieze about the event which she said was distracting to other stallholders and impeded the flow of visitors. The Social Work section was devoted to women artists left out of the mainstream art market who turned to teaching to earn a living. Eight artists were selected by a group of art historians, curators and writers, among them Mary Kelly, Berni Seare, Sonia Boyce and Helen Chadwick. 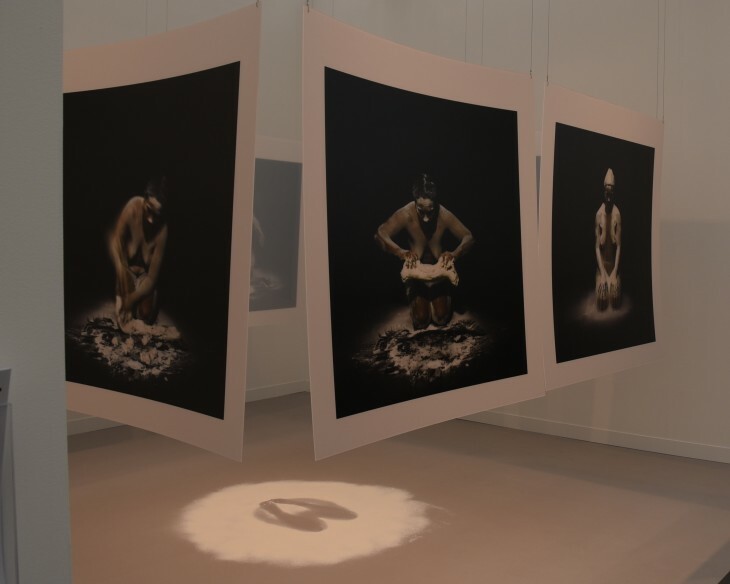 Stevenson presented a work by Seale, a black South African artist who concentrates on photography, video and film, and is now a major figure in Cape Town art school. The impressive Still, (above) is a sequence of large semi transparent photographs in which the artist is shown kneading bread. The images play with ideas of colour – the white flour on the artist’s skin, and gender – the woman’s place as a labourer kneading bread, the substance on which others depend for food. Inevitably there were infinite selfie possibilities at Frieze, none so blatant as the series of neons by David Shrigley presented by the Stephen Friedman Gallery. 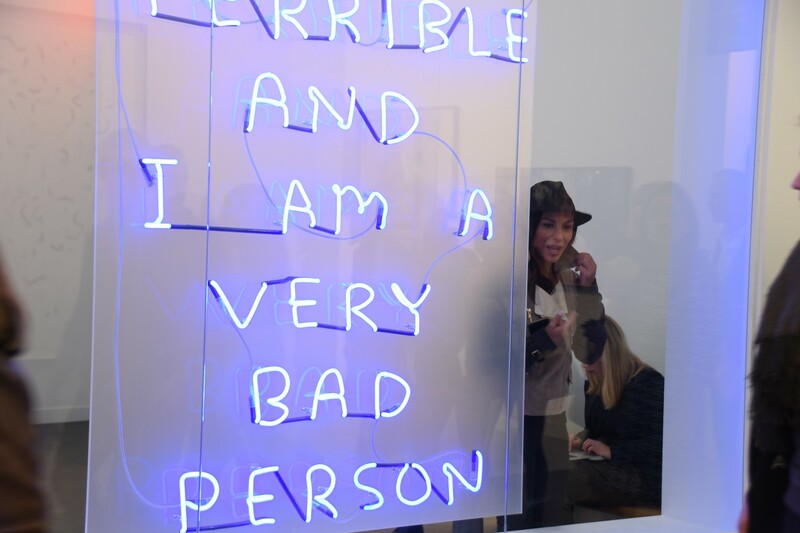 The satirical messages by the British artist proved irresistible to visitors. It was Gucci handbags at noon as they jostled for a chance to prove their ‘bad’ credentials. 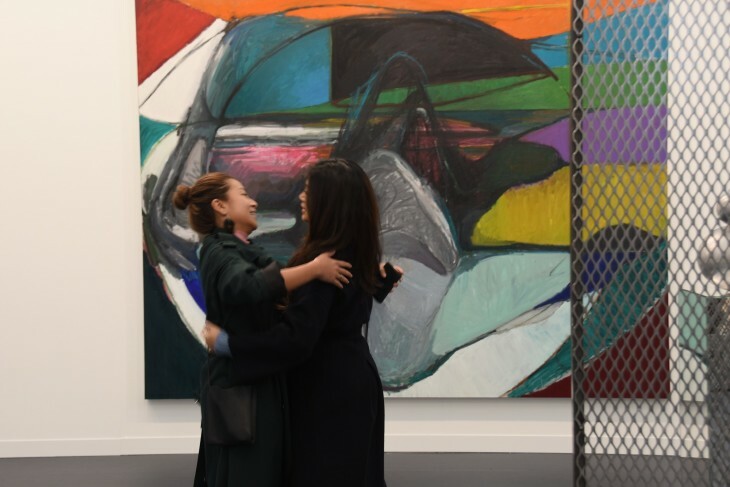 Bold and beautiful paintings evoking imagined landscapes by Lui Wei were on show at White Cube’s outstanding cage like stall designed by the artist. 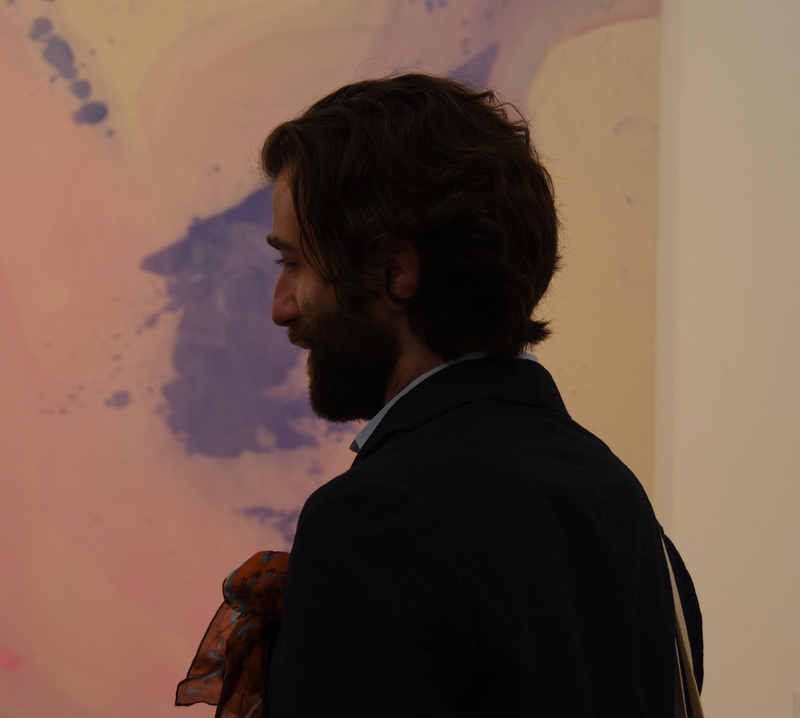 Turning Air Blue IV by Rita Ackermann (above) was among the works on show at Hauser & Wirth’s stand at Frieze London 2018. Spotlighting works from the gallery’s family of artists – including Mark Bradford, Phyllida Barlow, Zhang Enli, Jenny Holzer, Roni Horn, Lorna Simpson and Mark Wallinger – the works reflect the diversity of artistic practice in the contemporary era and include new works of art historical importance such as Gunther Forg’s Lead Paintings. Gagosian’s centre stage booth featured a series of three large triptychs by Urs Fisher that evolved from an earlier work, Sotatsu. 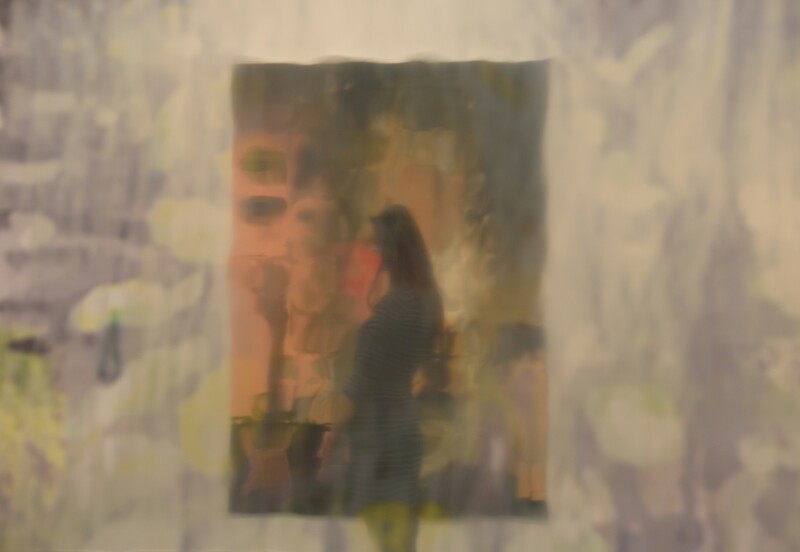 The paintings were made by hand using a digital substrate, then silkscreened onto aluminium panels, with some mirrored areas showing through reflecting the viewer and surrounding paintings. Depicting personal spaces known to the artist; a garden, a living room, a kitchen, the works suggest a realm were reality and abstraction co-exist.